How is it we are fascinated by the grotesqueries of murder? Surely, they follow in the footsteps of our own fear of each other, and the fear of our own anger’s potential? Laughter, though, is the great antidote. One Stephen Sondheim used to exceptional effect in his acclaimed and as-blackly-comic-as-it-gets musical Sweeney Todd: The Demon Barber of Fleet Street. Originally produced for Broadway in 1979, Sweeney Todd made its company premiere with San Francisco Opera this month in a co-production with Houston Grand Opera of the 2011 production at the Paris Théâtre du Châtelet. A production well deserving of the Opera House’s adoring audience. Baritone Brian Mulligan had the enviable opportunity to sing the murderous Todd, who was unjustly transported to Australia by a perverted judge who coveted Todd’s innocent and beautiful wife. Todd has had 15 years to hone his plans for revenge, but they never fall into perfect realization until he encounters his former neighbor, the playfully pathological purveyor of meat pies, Mrs. Lovett. Mulligan plays Todd to the max, endowing the demon barber with obsessive revenge while projecting a subtle helplessness, his big dark voice plangent with longing and madness. And the magnificent Stephanie Blythe is wondrously splendid as the amoral Lovett. Together the two capture and hold the stage without undercutting the rest of the excellent cast. They make the most of Sondheim’s devilish wit as they sing the long, first-act duet on their cannibalistic preferences. Priests, it seems, are fresher, though perhaps fatter, than solicitors: “Then again there’s sweep/ If you want it cheap/ And you like it dark.” But it’s all really a matter of … taste. Witty and insouciant lyrics have always been Sondheim’s strong suit, but the music holds up to the words. It’s complex, and perfectly integrated. Melodic, though falling quite a bit short of soaring lyricism, in both sound and language (“I feel you/ Johanna”. Really?). Maestro Patrick Summers led the orchestra through the score’s many brilliant sonic intricacies. Only the amplification was annoying. Isn’t it always? The leads had body mics, and there was a distinct difference between the levels of amplification. There’s also that weird hollow sound that seems unavoidable with body mics. 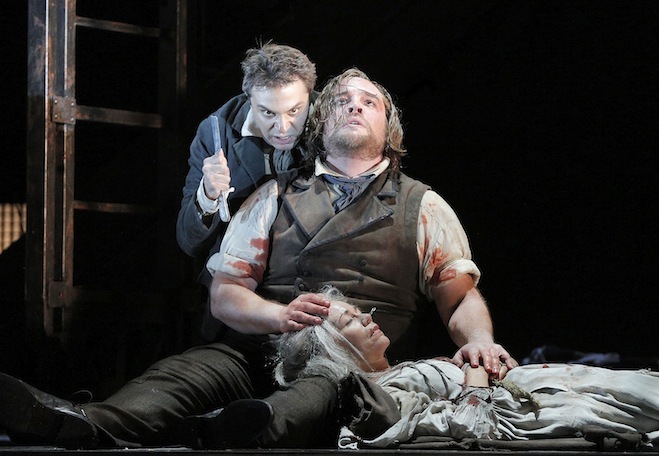 Although some of the dialogue is spoken, and therefore perhaps less accessible in the cavernous reaches of the Opera House, most of Sweeney Todd is sung. Solid performances were put in by the entire cast, with Elizabeth Futral as the mad and raunchy Beggar Woman; Heidi Stober as Todd’s daughter, Johanna; Elliot Madore as the kindly sailor who befriends Todd; and Wayne Tigges as the evil Judge Turpin. To name most but not all, though all deserve praise. The chorus was a delight. Lively direction was provided by Lee Blakeley, who ably moved the cast around the split-level and labyrinthine set. The production design was by Tanya McCallin. The basic concept of the barber’s chair that tilts back to provide a slide for bodies into the meat grinder below was provided by the Victorian penny dreadful, The String of Pearls: A Romance (1846). And a fine concept it is. Sweeney Todd: The Demon Barber of Fleet Street continues at the War Memorial Opera House through September 29. For information and tickets, visit www.sfopera.org.